The big boys—and I do mean the BIG boys—want us to feel passionately about one political party or another, whether the Democrats or Republicans in the US, the Labour Party or Tories in the UK (maybe even the Lib-Dems), or the Labor Party or Liberal (turned conservative) Party in Australia. They’re probably also delighted when I go troppo as Paul Chapman sends a hallmark outside-50 through for another Geelong goal. You see, these are great distractions from the fact that they’re stealing from you, and, like you, the news media don’t really want to know about it either. They’ll cover the politics and the footy, but not the world’s greatest rort (that’s ‘scam’ for people in the US). No, the big boys aren’t your bank manager, nor even your bank’s CEO—although that’s getting pretty close—it’s the BIG guys who’ve run the banks for centuries and know how they really work. But it’s impossible to get these thieving plunderers behind bars for their criminal pursuits. You and I have exempted them from it, because we’d rather believe in political parties and football teams. There is ONE way to get at them in future, though. No, not by governments issuing the currency; no, not by Glass-Steagall-like financial regulation. These might assist, but they are only mosquito bites on their bums (‘asses’). No. Pass an act to abolish income taxes and levy instead a charge on land values. Oh! How they’ll get you—their victims!—to squeal solicitously for them when the legislation is first proposed—something like innumerable Australians did for Gina Rinehart when the resource super-profits tax was first announced. Yes, Gina and her cronies did take part, too. They kicked in a quick $25 million for nonsensical advertisements telling us we had no right to our mineral resource rents and that our mines would be taken overseas … and some of us believed them. And these impecunious billionaires did hold a street protest to win others over. In the afterglow of the rort perpetrated upon them, and a questionable change of Prime Minister over it, it now seems most Australians have had reason for second thoughts. Oh! And won’t they wheel out the poor widow who can’t afford the land tax? But surely they’d be happy to see their massively higher land tax assist the poor widow? So, as things take a turn for the worse, forget the political parties. Forget pillorying the banks. Demand an all-in, no exemptions, single rate levy on all Australian land values at the rate of 6% (see previous post)—and for abolition of income taxes on all productive labour and capital. 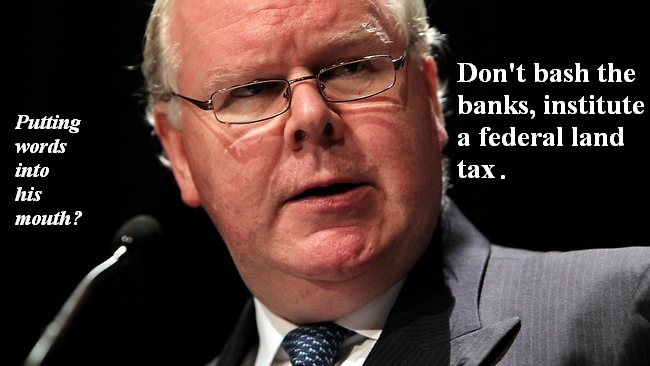 THEN, and only then, will you have them, the 0.01% where they need to be: paying their fair share. It’s not class warfare: it’s economic justice. And remember, you first saw THE ANSWER here. That we turn on every night as if we are watching Neighbours on TV, with all their petty feuds and Personality tantrums, just to divert us that they have slipped in the back door and taken our wallet right off the dinner table without us noticing. We have become desensitised to the fact they have us in trance hooked on their B grade drama, and are learning to be helpless to it all, while their economic crimes go unnoticed by the large masses. ‘Too bend a Lennon quote,Conspiracies are what happen too you when your making other plans’ In this case it was to be lured into duller wits by their bread and circus, to conceal the real Agenda that my cartoon titled ‘N-EURO FIDDLES WHILE DEMOCRACY BURNS’ highlights. The technocrats have taken over & democracy is an illusion. As for the economic board on TV saying Australians pessimism, that they are in Greece, my reply. What island does he think he lives on? Tax free Majorca, with Christopher!